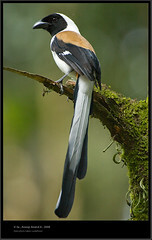 The Hooded Treepie (Crypsirina cucullata) is a species of bird in the Corvidae family. It is endemic to Burma. Its natural habitats are subtropical or tropical moist lowland forests and subtropical or tropical dry shrubland. It is threatened by habitat loss. It has grey plumage apart from black head, tail and flight feathers. The White-bellied Treepie (Dendrocitta leucogastra) is a bird of the crow family endemic to the forests of southern India. 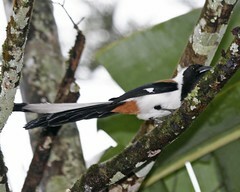 The white of the head and body separate it from the sympatric Rufous Treepie. 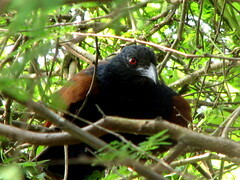 This tends to be found in more dense forest and is less associated with humans than the Rufous Treepie. The species is often seen bowing and lowering its wings as it calls. 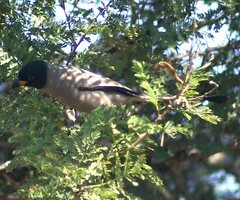 Several birds may arrive at one tree and call repeatedly during the pre-monsoon breeding season (April-May). The nest is a platform of twigs on a medium sized tree. Three eggs are laid, ashy grey with green and grey blotches. It is associated with mixed-species foraging flocks and is often associated with Greater Racket-tailed Drongos. It is found in the forests of the Western Ghats south of Goa. A record from Erimalai near Dharmapuri marks the eastern limit of the species in southern India. It has been reported from the Surat Dangs and the southeastern Ghats of Andhra Pradesh while a record from central India has been questioned. Listen to its call here.